The concatenation operator (+) concatenates two or more string values together and return another string which is the union of the two operand strings. The shorthand assignment operator += can also be used to concatenate strings. 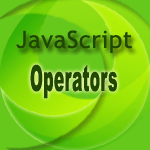 The following web document demonstrates the use of concatenation operator (+) and shorthand assignment operator +=. See the Pen string-operator-1 by w3resource (@w3resource) on CodePen.